French IT firm Atos was contracted by the Department of Work and Pensions, at a cost of £112.4m, to administer the notorious Work Capability Assessment (WCA), designed to cut the national spend on social security. The WCA has led to the deaths of thousands of disabled people. Many more continue to experience serious distress and poverty. Combined with government and press rhetoric against disabled people and benefits claimants, hate crime against disabled people has skyrocketed. At the London 2012 Paralympic Games, Atos became an official sponsor, continuing their sponsorship into the 2016 Rio Games. 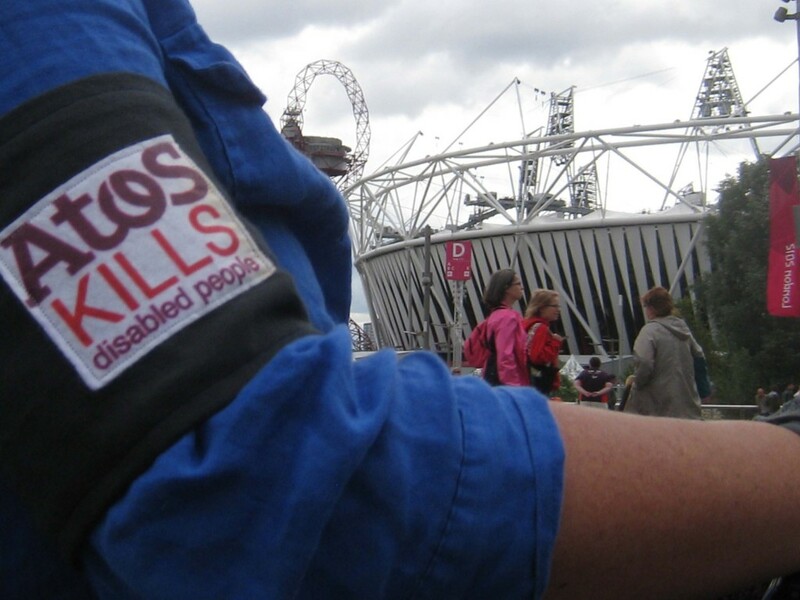 In London, artist Liz Crow took the fight against Atos into the heart of the Games, wearing a homemade anti-Atos black armband stating: ‘Atos kills’. In doing so, she took up the battle cry of activists protesting nationwide against the WCA. The image of the armband against a backdrop of the Olympic stadium was widely circulated online raising awareness, provoking discussion and affirming the accounts of disabled people. “Atos have come under fierce scrutiny for their handling of the Department of Work and Pensions £100 million a year contract, assessing whether claimants for incapacity benefits are ‘fit for work’. Last year 1,100 claimants died while under compulsory work-related activity for benefit ; and a number of those found ‘fit for work’ and left without income have committed or attempted suicide . In a recent episode of Dispatches , a hidden camera revealed Atos staff being pressured into declaring people fit in order to fulfil targets, instead of assessing people based on individual needs. “The British Medical Association, disabled groups, and MPs have all demanded the work capability assessments be ended immediately. In June, the BMA  in Scotland and England demanded the WCA end with immediate effect. This was followed by an Early Day Motion , signed by 83 MPs, criticising Atos assessments and their sponsorship of the Paralympics. And earlier this month the High Court granted permission for two disabled people to bring a claim for judicial review against the Secretary of State for Work and Pensions, challenging the operation of the WCA . “Paddy Murphy, a spokesperson from DPAC said: ‘ATOS receive hundreds of millions of pounds while many disabled people are being forced to live in abject poverty because of their decisions. By sponsoring the Paralympics, ATOS is trying to give the impression of supporting disabled people. Don’t be fooled. This is just another opportunity for them to ‘cash-in’. But we aren’t going to let them off the hook. We will make sure everyone knows what they are about.